BOSCH, MAKITA, DeWalt, HITACHI, MILWAUKEE electric and cordless hammer drills. "Max drilling diameter in concrete" filter will help you to find right tool easy and quickly. For example, if you usually drill 15 mm holes, set the range up to 26 mm by sliding the filter ruler. Tool will serve longer and work will be done quickly if it is not overloaded or work at maximum capacity. 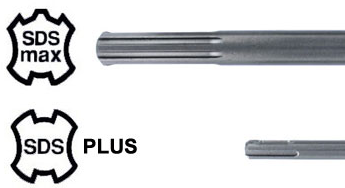 In category "Drill bits for concrete" we offer more than 800 SDS-max and SDS-plus drills. Other accessories for hammer drills you can found in categories "Chisels", "Holesaws", "Hole saw adapters and centering bits", "Chucks" and "Oil". Hammer drill or Impact Drill. What tool to choose and what‘s the difference? Efficient concrete, masonry and stone drilling is a completely different process to drilling in wood, metal, plastic or other similar materials. In this case, drills with sharp edges cutting material doesn‘t fit. During drilling process concrete, brick or stone must be broken into very fine particles - it's like working with a small rotating chisel. In order to effectively drill concrete, bricks or stone, two different movements must be used simultaneously: impact movement along the center of the drill axis (chiseling material at the tip of drill) and rotating movement around its axis (removing crushed material by drill spiral and forming a round shape of hole). Therefore, the drills for construction materials and stone are different from the usual drills. Drill tip is not sharp, but it has very hard and tear resistant metal plate insert. There are two types of tools which can simultaneously perform rotational and impact movements. These are hammer drills and impact drills. Impact drill is a screwdriver / drill with an additional impact function, which enables to drill construction materials using a drill with hard metal plate insert on its tip and cylindrical shank. If impact function is activated, the entire tool grip moves forward / back at a high frequency, but its travel is very small, and therefore the power of this impact is small. 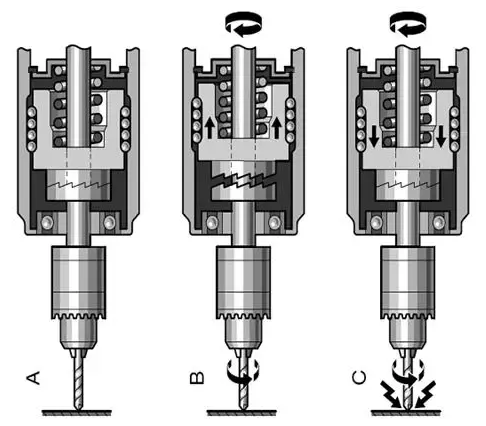 Drilling speed directly depends on the pressure force of the tool. This solution is suitable for craftsmen, who only occasionally need to drill small holes in building materials (no more than 30 % of all drilling works). If the need for drilling in construction materials is more often, it is necessary to choose a tool, which is specially designed for such application – hammer drill. Hammer drill is a special tool for drilling in concrete, masonry and stone. Main element of this tool is an electric motor actuated pneumatic cylinder, which transfers impact via striker (1) and striker pin (2) directly to the end of the drill bit shank. In order to obtain a higher impact power, a bigger drill bit travel distance is required. Therefore chuck and drill bit shank have special design. During operation, the grip only rotates. Forward / backward movement makes a drill bit. It‘s shank has special fixing and guide grooves. Such drill bit fixing system is called SDS. Hammer drills are also divided according to drill bit diameter. Up to 4 kg hammer drills usually have SDS-plus system (for drills Ø 4 - 30 mm). Since the SDS-max drills have a larger diameter (for drills Ø 12 - 45 mm), it's natural that SDS-max hammer drills are more powerful and heavier. Almost all tool manufacturers use this SDS system. This attachment system was announced in 1975. It was presented by „Robert Bosch“ company. This system name is the abbreviation of words "Steck-Dreh-Sitz" (insert, rotate, fix). - drilling (drilling in wood, metal, plastic, etc. with cylindrical shank drill bits and crowns). To drill in wood or metal with a hammer drill is not enough to switch the drilling mode - you still need to put a chuck, which can grab drills and other attachments, having cylindrical shank. Universal hammer drills have quick change SDS type and usual type (with 3 fingers) chucks. If hammer drill has a fixed SDS chuck (without quick change system), for drilling without impact you must insert standard chuck (with 3 fingers) into SDS-type chuck as an attachment. This additional chuck must have special SDS type shank. You might also be interested in demolition hammers, which are specially designed for heavy duty chiseling works in concrete and masonry.